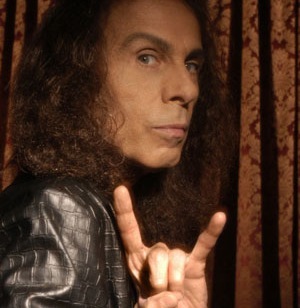 This morning, over breakfast, I learnt the sad new that Ronnie James Dio had lost his battle with stomach cancer on Sunday morning. So, I though I would dedicate today’s post to the great man. It is always difficult to do people justice when writing an obituary, so, I think I will just let his contributions to music do the talking. However, what I can say is that I know that he will be sadly missed by fans. Anyone who has the experience and privilege of seeing him perform live, whether in Elf, Rainbow, Sabbath, Dio or Heaven and Hell, will know exactly why he is held in such high regard. His performances in the studio were excellent, but there was something about seeing him live and the professionalism that he exuded which really made you appreciate the greatness of the man. I consider myself very fortunate to have had the opportunity to see him at the Brighton Centre (UK) as part of Heaven and Hell in November 2007. Unbelievable performance and I have managed to find a clip of the gig on Youtube – Sign Of The Southern Cross. There are also a number of live albums that he appears on and are worth checking out as a snapshot of his live performances from a particular era, apart from Dio stuff, I’ve only listed one from each ‘band’. I also particularly enjoy the posthumous Rainbow live albums. Check out the live performance at Rockplast 2009 of Bible Black, from the album, The Devil You Know. The mighty 3 Inches Of Blood played The Paragon Theatre in Halifax on Saturday, and we were there!! Support was provided by Goatwhore, Barn Burner and local Cole Harbour band Black Moor. However, I must admit to being only familiar with 3 Inches Of Blood. And, check out the video for Apocalyptic Havoc on YouTube. Unfortunately, we missed local band Black Moor, as they were added after the tickets were printed and so we arrived at the door as they had just finished up their set. I’m sure we will get to check them out again around the Cole Harbour/Dartmouth/Halifax area. Check out the lead track from their 2009 album The Conquering, they sound awesome! “Black Moor’s commin’ after you”. Here’s an interview, with the band, about the Cole Harbour metal scene. Here is Battles and Brotherhood from the aforementioned album. Of course, 3 Inches Of Blood had to finish up their set with Deadly Sinners! But no Forest King in the set, [sigh]. Well, better remedy that. This morning we, over breakfast, were having a chat about the fact that the rescheduled Megadeth/Slayer Tour of Canada will have both bands playing their 1990s albums Rust In Peace and Seasons In The Abyss, in entirety. I then got thinking about metal albums from that year. Here is my list of 10 favourite albums from that year. Better have something for the pain! Grab Your Plastic Sword – 3 Inches Of Blood On Tour – Awesome!! !